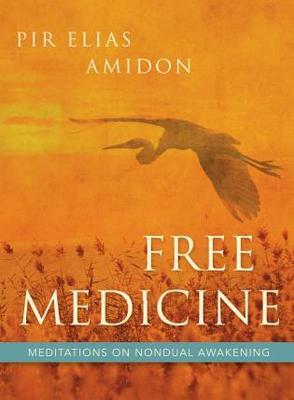 Free Medicine is a collection of forty intimate meditations written by Sufi teacher Pir Elias Amidon. Whether describing a naked dive into a pond in the middle of the night, or a confrontation with soldiers in a Burmese temple, these meditations can serve as companions for those whose deepest desire is to know first-hand “the good news at the heart of reality.” Human, accessible, and tender, Free Medicine has the power to open us up in ways we never expected. and is the candle, and the light? Amidon’s close connection with nature; his compassion for people in distress; his simple, clear observation of the mysteries of life and death; and his calm sense of humor combine in intriguing ways to reveal the uncaused happiness that is our essence. We do belong here. We belong together. We belong with the great community of life on earth. We belong in the cosmos, and in the heart of All Being. Our belonging is immanent and self-evident in this moment. Experiencing the immediacy of this revelation is the deepest desire of these writings. Also by Elias Amidon is The Open Path: Recognizing Nondual Awareness. He also co-edited the wonderful Earth Prayers and Prayers for a Thousand Years with Elizabeth Roberts. Free Medicine is a collection of forty intimate meditations written by Sufi teacher Pir Elias Amidon. Whether describing a naked dive into a pond in the middle of the night, or a confrontation with soldiers in a Burmese temple, these meditations can serve as companions for those whose deepest desire is to know first-hand the good news at the heart of reality. Human, accessible, and tender, Free Medicine has the power to open us up in ways we never expected. In the words of Keith Dowman, author of Natural Perfection, Although it comes packaged in different languages, cultures and religions, deep mystical insight spirals around a single heart-core: here is Elias Amidons inspired Sufi reflection of that ineffable nondual reality. Amidons close connection with nature; his compassion for people in distress; his simple, clear observation of the mysteries of life and death; and his calm sense of humor combine in intriguing ways to reveal the uncaused happiness that is our essence. Reading this book is a wonderful experience, full of brilliant insights, stories, images, lots of free medicine, says Coleman Barks, author of The Essential Rumi.